John Flanagan, author of the Ranger's Apprentice series and the Brotherband Chronicles, is probably my children's favorite living author. His books are excellent adventure stories with endearing characters and frankly, just a lot of fun to read. He was so encouraging when I first emailed him (oh soooo many years ago!) about The Professor's Ranger's Apprentice-themed birthday party complete with cloak, pendants and oak leaf pancakes. We conversed back and forth a little via email. He even wrote The Professor the most awesome birthday email and was delighted at all the pictures we sent him of the big day. Well, his only flaw is that he lives in AUSTRALIA, not Texas, and Australia's only flaw is that it's half a world away from Texas! I guess maybe God realized you couldn't have that much awesome all on one side of the earth so He had to split it up. So, around the time Miss Cupcake made her appearance, Mr. Flanagan, or my "Good Buddy John", as I like to call him to tease the kids (because, you know… we were email buddies), was coming to our area for a book tour. There is some debate. My kids say he was coming to Oklahoma. I thought it was Austin. Anyway, I apparently made the comment in a daze of postpartum hormones and lack of sleep that if he ever come back on another book tour, we would go no matter what! You know what happened, don't you. But thankfully, Cupcake was no longer a babe in arms and my Good Buddy John did come to Austin which was close enough for us to drive to in an afternoon. So, after The Professor had finished up his online classes for the day, we kissed Sean and Cupcake goodbye and the big kids and I headed down to my dad's house the afternoon before the book signing. We had never seen my dad's new house and he was happy for us to come visit even if it was briefly. He took everyone out for some pretty awesome hamburgers and after that we promptly crashed in bed. We woke up super early the next morning to give ourselves time to get through Austin traffic (I hatehatehate driving through Austin!) and make it to the The Book People to pick up the books we had pre-ordered and our colored wrist tags. We wanted to be in the first wave of people through the line because we were planning to head back home that night. family who lived in Austin so they didn't have as far to travel. This was taken at about 8:45am. See that sign above? The book signing wasn't until 6pm. We had approximately the entire day to kill in Austin. Austin? Ugh… not my favorite place. What is there to do in Austin? Well…plenty, thankfully. 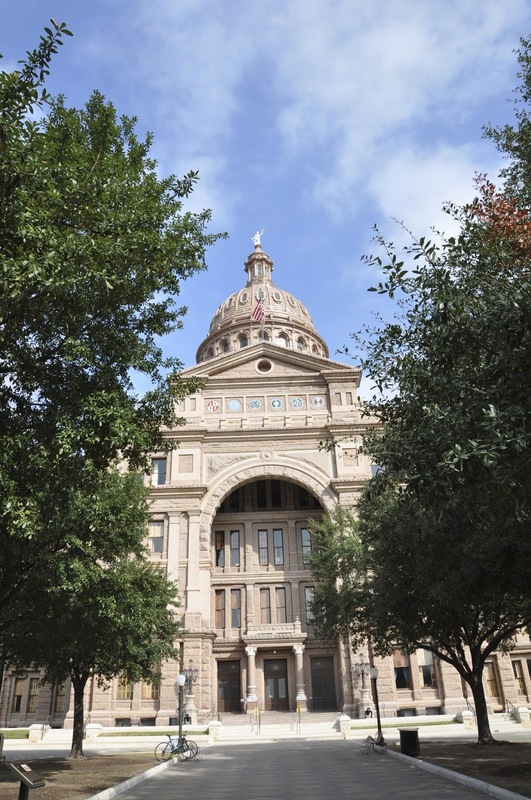 First stop… the Texas State Capital. 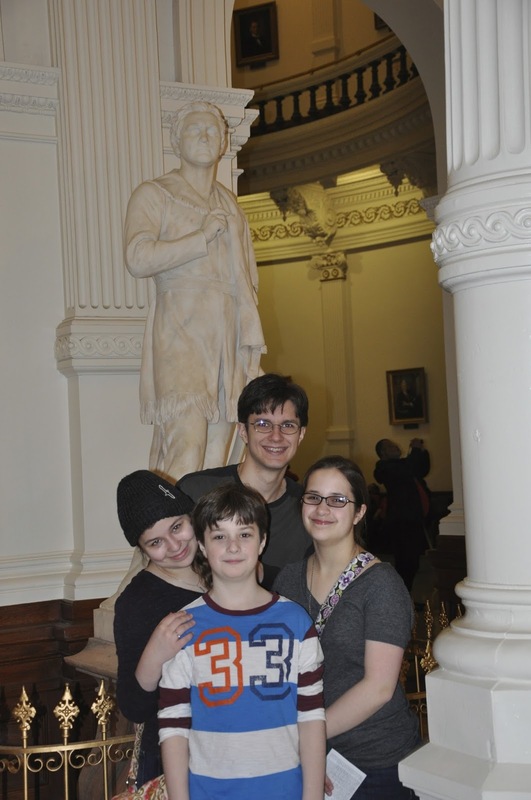 My Granny insists that our family is related to the big marble guy behind them (Sam Houston). The man in the picture above BigBoy was James "Jim" Ferguson. My grandfather's name was not Jim, it was Vaclav, but he was called Jim for most of his life thanks to this man. He was not the best governor and not even in office when my grandfather was given his name. 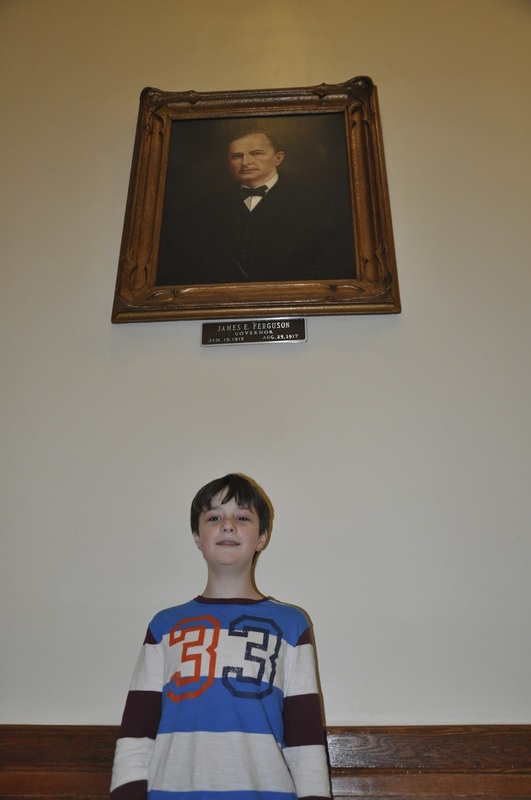 The story goes that one day, his school took a trip to the state capital and my grandfather (whether intentionally or not he never admitted) got separated from the group. When he was caught later and returned to his group, the person who found him apparently said, "He was just wandering around like he owned the place…like he was Jim Ferguson!" Ever since then, he was called "Jim". 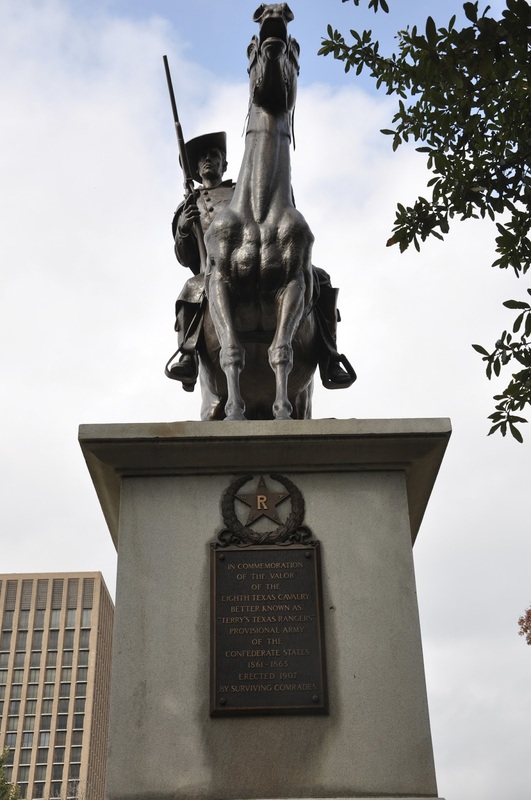 Down below the capital, there is a permanent memorial to Texas recipients of the Medal of Honor and another space for temporary memorials and exhibits. 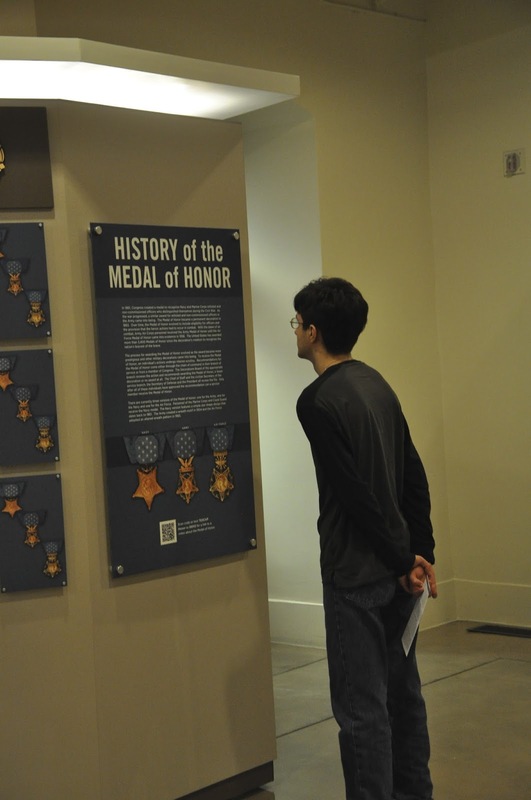 When we were there, the Texas Funeral Directors Association had put together a "Remembering Our Fallen" exhibit honoring Texas soldiers who had died in battle. It was really moving. Family and friends had come to add mementos and notes to their loved one's pictures. Afterwards, we headed outside for some fresh air and to burn through time on the parking meter. "There is no danger of a surprise when the Rangers are between us and the enemy." "I always feel safe when the Rangers are in front." We also had fun taking goofy pictures with the cannons on the lawn. After touring the capital, we made a trip to the Texas State Cemetery to visit my Pawpaw's grave. 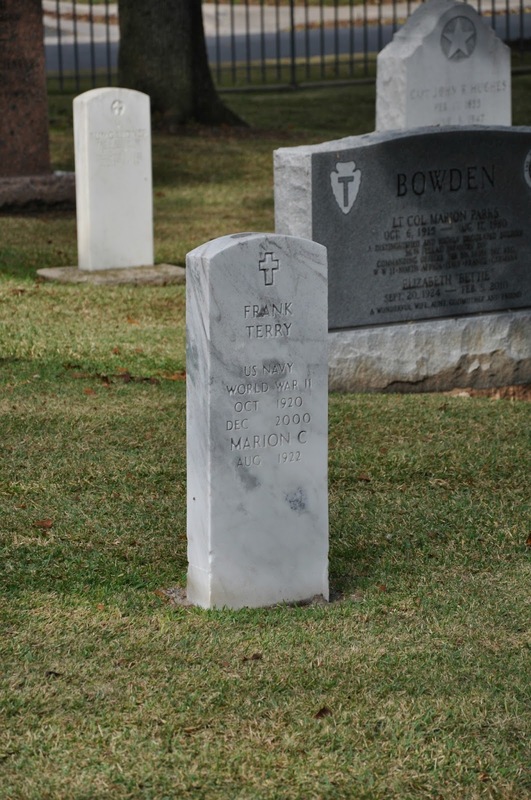 "Just blocks east of the State Capitol, the Cemetery is the final resting place of Governors, Senators, Legislators, Congressmen, Judges and other legendary Texans who have made the state what it is today." There are some very important people buried there, but he's the most important one to me. It's 14 years that he's been gone and I still miss him so much. Afterwards, we went to boost our spirits and stave off fatigue with a little lunch and then made our way over to the O. Henry Museum. 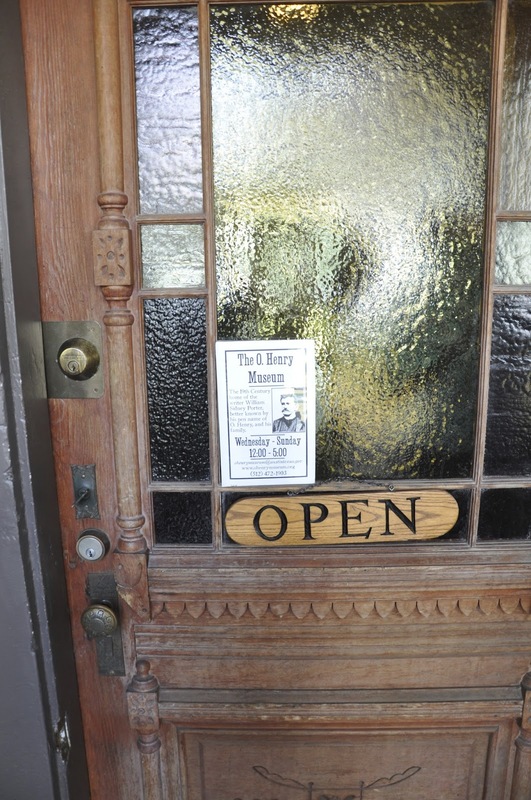 Well, they call it a museum, but really it's just a house that he and his family once lived in that still has some of his stuff. So, yeah… I guess that's a museum. Every year, they host a pun-off. The O. Henry Pun-Off World Championship in fact. For the past 37 years, they have been trying "to a-maize people with wacky wordplay and home groan wit from powerful punsters who are out standing in their field." Yeah. We are never letting my husband near that place. 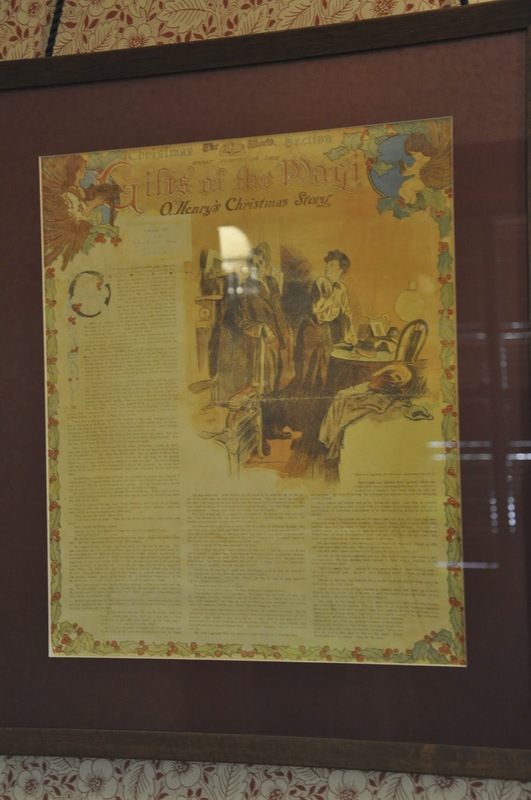 The first publication of Gifts of the Magi in The New York Sunday World on December 10, 1905. Sorry. Did that just up the PG rating on my blog? I didn't say it. Davy Crockett did! Done with museums and with the time getting closer to 6pm, we headed back to The Book People to hang out in their coffee bar, warm up a little with some tasty beverages and use the free wi-fi. See this hat? I'm going to come back to it in a second. We waited and waited and waited. 6pm came and went and still my Good Buddy John did not show up. I guess he was running a little late. I don't know why. He wasn't taking my calls. But when he finally showed up… there was rejoicing! Let me tell you, my Good Buddy John is exactly the kind of guy you'd think he'd be. He's the kind of guy you'd want to sit with in front of the fire with a giant pot of coffee and listen to him tell stories all night long. He's personable. He's friendly. He loves his fans. He loves his characters. He loves stories and you can tell, he's got a million of them to share. My kids adored him. They could. not. stop grinning. He talked for about an hour and then took time to answer questions and everyone was excited to hear his answers. No spoilers but he did mention that in the next Brotherband book, the crew of the Heron might travel to an America-like land. And he talked about a series that he's writing about Halt's early days… think Halt as a teenage boy instead of Will. He mentioned that right before he came to the US he had written the scene where Halt meets Lady Pauline for the first time. Awwwwwww! There was also talk about Ranger's Apprentice finally being turned into a movie! I can still hear the squeals of delight. In fact, I'm pretty sure those squeals did some permanent hearing damage. Finally, when everything was said and done… they each got to meet him. Sunshine had knitted two watch caps like the ones Edvin made in the 3rd Brotherband book. I embroidered a heron and we turned it into a badge for the cap. She gave one to him and kept one for herself. He said it was far superior to some other ones he'd seen mocked up. And he also wore it for the rest of the book signing! Rain borrowed The Professor's Ranger cloak since he'd outgrown it many years ago and John called her "Ranger Girl" which made her blush and giggle like I've never seen before. She is not my giggle prone girl. Fangirl moment! He also remembered The Professor's birthday post and the oak leaf pancakes! Ok… it was my turn to blush and giggle then. Mommy fangirl moment! "Everybody lean in!" Not the best picture taking advice. The excitement didn't wear off until we reached home about 4 hours later that night. It was a really long day and everyone took a couple of days to fully recover but they all said it was totally worth it.